It was a bit chilly this morning so i made my way out to the wood shed for an arm load of wood and a handfull of kindling to get rid of the morning chill in the house. I saw my Kindling box was empty. An often occurance that I am sure many of you know. So i packed the wood into the house, then set off back outside for some morning twilight kindling chopping. Usually I will chop enough to fill my box, and stop there. The box is approx 2ft long x 1.5ft wide x 1.5ft tall. It holds enough kindling for a couple of weeks any ways. So If illed the boxy, grabbed and handful, and went back into the house and got a fire going. With the fire soon roaring and wood stacked into the stove and heat for the morning secured, I thought about my often occuring lack of kindling, and how much I really don’t care for chopping sticks in the freezing cold right before daylight. So I figured I should go out and chope a little more to play catch up. I filled the box to the brim, and still had some left over. I had an idea, and just kept on chopping. Once i had a small mountain of kindling all chopped and a couple of hours gone, I went to work tying bundles. Basically a bundle holds a few handfulls of kindling sticks (probably 2-3 days worth in each). Tied the bundles with extra pieces of string, crap rope, and bailing twine, just what ever cordage i had laying around the wood shed area. In all I chopped 15 bundles, on top of filling my box. 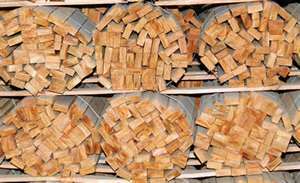 My thought, is I stacked all the bundles into the wood pile, and will save them for next year’s use. The box I will use for this years. Next time my box gets empty, I will fill it and chope 15 more bundles. Doing the same process of storage. I figure that way it wont take but a few more cuttings, and i will have enough kindling for the whole winter next near. 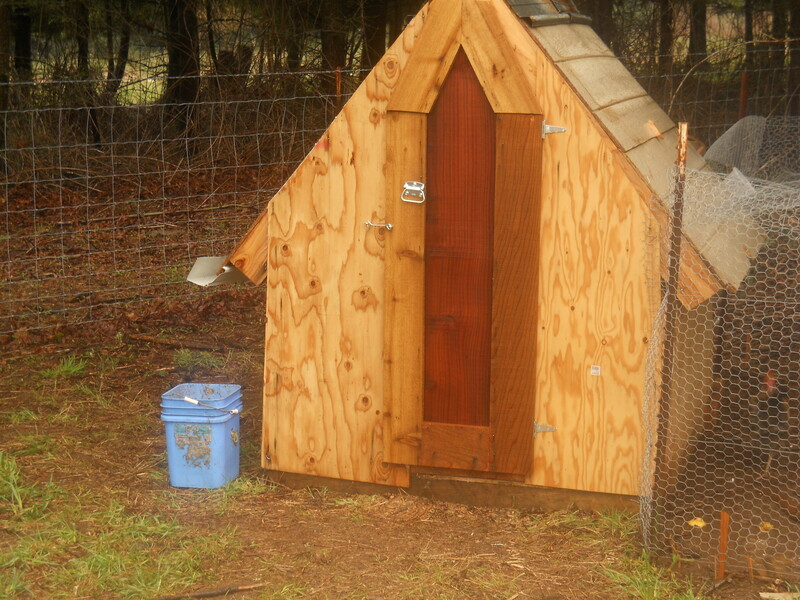 We built our Chicken Coop around March of 2012. I just used scrap pieces left over from putting up our house. Extra and end cuts of plywood, left over pieces of 2×4 and 2×6 from foundation forms, some old fence posts i had extra laying around, left over nails, etc. I also had some scrap tin left over from a wood shed i constructed, to i thought that would make a good roof. Inside the roosts are made from Maple branches i cut and and then screwed into place. Seems to work great. I think the only thing i had to buy was a small roll of chicken wire (approx $10). Keeps them plenty warm and out of the elements in the winter and rainy seasons, and vented enough to keep them cool in the summer. We had a few more at one time, but after a little culling and some chicken dinners, we are now down to 9 chickens. Americana’s, Naked necks, Coo-Coo Morans, Bardrock, and a few other breeds I recieved from a barter than I am unsure of the breed. Farm fresh Eggs all year round.